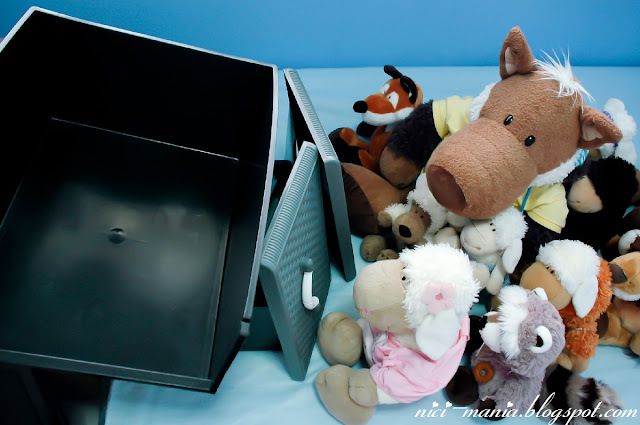 NICI toys at NICI-Mania have a new storage compartment! This is where our nici toys are currently staying and this cupboard will not be able to fit the ever-growing number of plush toys coming in every month. Other nici toys residing in this box are worse off, they were stacked 4 to 5 levels on top of each other and squeezed tightly in the box, so we went in search for a new storage compartment for our nici toys and found a suitable and inexpensive 5 tier plastic drawer from Carrefour hypermarket. Some of our nici toys Jolly Mah, Jolly Wolf, Sheebo, Big El Lion, Rob Raccoon, Frederic Fox eagerly crowd around with the head of the family Hugo Wolf & Jolly Rosa to witness the grand opening of their new storage compartment. Jolly Rosa who could not suppress her excitement went in first to open the carton to check out our new nici toys storage compartment. Looks like we have to DIY assemble this 5 tier plastic drawer ourselves. We could hear the nici toys at NICI-Mania mumbling among themselves to decide who should be the one responsible to assemble the new storage compartment. Jolly Rosa orders Hugo Wolf to go assemble it NOW. Other nici toys responded in silence, hoping not to get named by Jolly Rosa but the plastic drawer is pretty easy to fix, there were no instruction manual given, just some joints to put together, no bolts and nuts required. Thus after 10 minutes later..
NICI toys 2011 new storage compartment is up and ready to use! The 5 tier plastic drawer from Carrefour hypermarket is made in Malaysia as stated on the box, the quality is pretty good, its not flimsy or shaky. Our nici toys are all very excited to check out their new house! Hugo Wolf jumps in moments later: Rosa, I wanna join you ~ Jolly Rosa shoves Hugo with her elbow: In your dreams! The mountain of nici toys at NICI-Mania stacked on top of one another getting ready to be moved into their new storage compartment. The fun thing about this picture is, 2 seconds later all our nici toys collapsed, it was like a disaster. 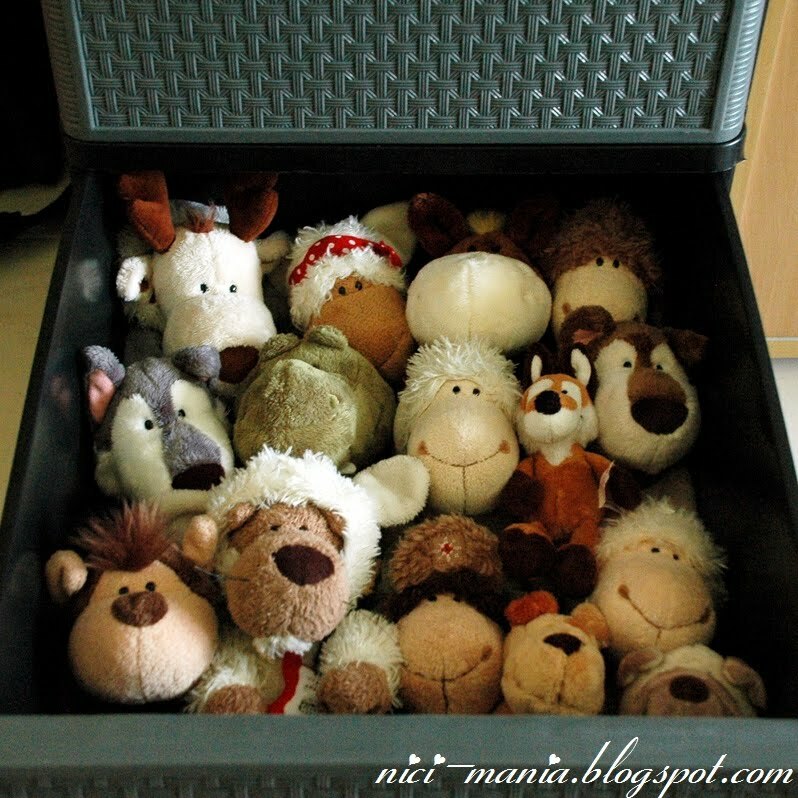 A single plastic drawer can fit around twelve 25cm nici toys sitting quite comfortably with extra space for some additional 15cm plush toy. But Jolly Wolf found it a little too cramped with other 25cm nici toys in the drawer, he moves up a level to catch a breather. 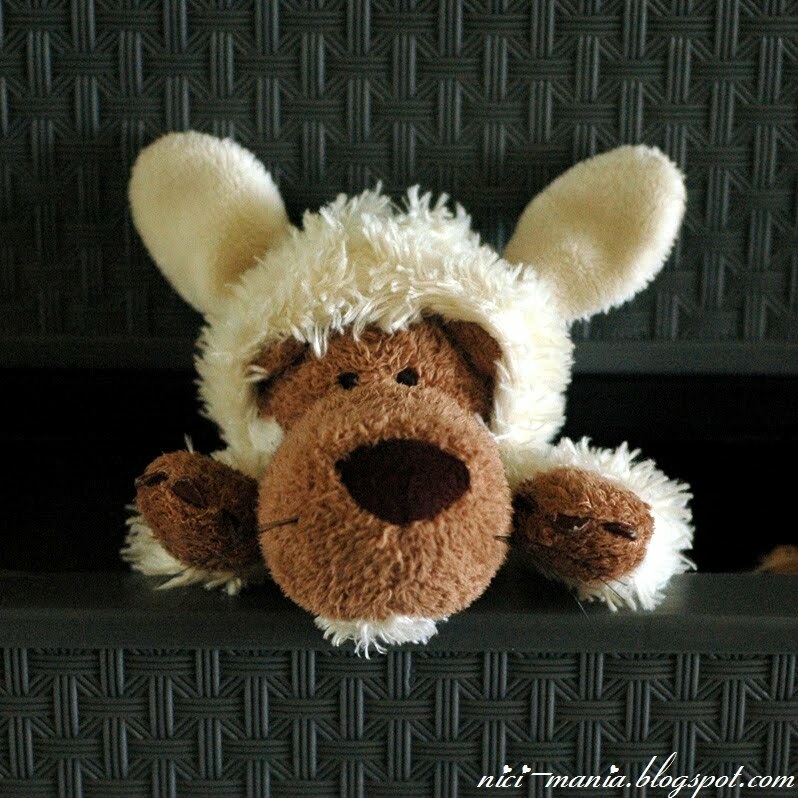 We love how cute Jolly Wolf looks in this pose with his rabbit like sheep ears pointing up. So guess what some other nici toys did? NICI forest friends Frederic Fox and Rob Raccoon. They just look so cute in this picture. NICI wild friends nici zebra & nici lion both getting ready to move in too. 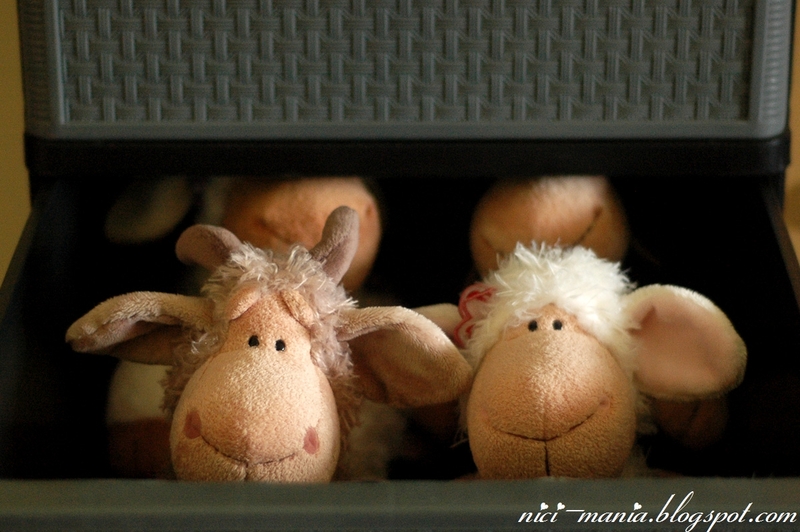 Elsa & Gustav are in but our 35cm nici toys cannot sit inside because the height of the drawer is about 25cm, their head will get brushed when we open and close the drawer. 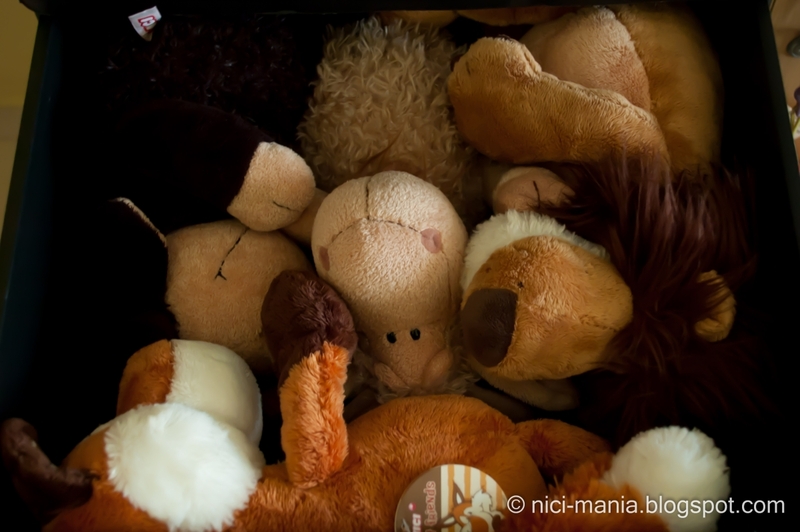 Not a very safe thing to do, hence..
We have to rearrange them and now, eight 35cm nici toys can fit not-so-comfortably stacked over each other in a single drawer. Underneath these four plush toys is another four squeezed pretty tightly, not very ideal for our plush toys but no choice. This is another drawer with our 35cm nici toys also stacked on top of one another, nici raccoon our dounut eating king munches away~ nom nom nom. Rob looks extremely happy. Kay poh (busybody) Hugo Wolf climbing onto the third drawer to check out how some of our nici toys are doing in their new apartment. NICI-Mania's recent arrival of Fu Bao Panda and Jolly Elsa seems pretty satisfied with their new home sharing the space with other nici toys like Sheebo and Liselle. The only worry in our mind is, this 5 tier plastic drawer from Carrefour will be fully occupied well before end of 2011. Currently, four of the drawers are already full and we love buying 35cm nici toys. With Ralf Rabbit and NICI Pirates coming, we should plan for another storage department soon as Calvin Skunk and Hetch Hogan are waiting to join NICI-Mania too. 80cm Hugo Wolf cannot fit into our new storage apartment, this poor nici wolf plush is going back to the old cupboard but at least now he doesn't need to squeeze with other nici toys anymore. Hugo can enjoy one messy cupboard all by himself! p.s. we found some nice Ipod accessories on sale at Carrefour hypermarket's IT gadget department. NICI-Mania will share them with you in the next blog post. How nice you have a new way to store your nicis. The problem is to buy more and then that space will going to be short haha. I had to buy a new house for my Nicis, I found it at Media Markt: actually it is a furniture for keeping CDs and DVDs, but it is fantastic for my 15 cm collection! 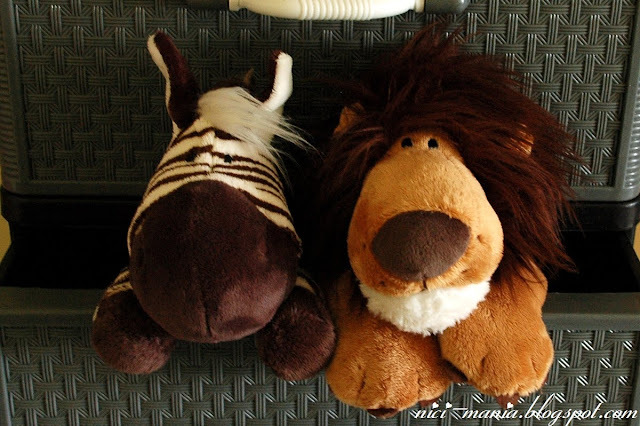 I agree with both of you, our nici toys will fill up this storage compartment soon, then it will be another headache to look for a new storage again! Unfortunately my flock of raccoons & friends wouldn't sleep anywhere else than fluffy beds. Spoiled plushies..
Also sheep need light. Are they allowed every day from the box? 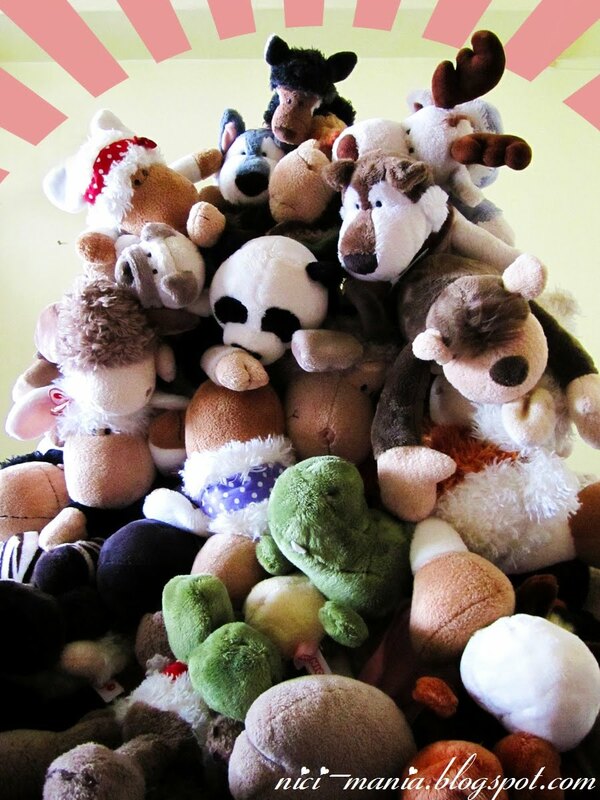 Soft toys must be held also appropriate to the species.But we know the problem, these become more and more and no more place is to be found.